Kolesnik D.L. *, Pyaskovskaya O.N., Yakshibaeva Yu.R., Solyanik G.I. Summary. The use of inhibitors of energy metabolism of malignant cells is a new promising trend in the treatment of cancer patients, based on one of the unique features of the malignant cell, namely the dominance of glycolysis over oxidative phosphorylation, even in the presence of oxygen, the so-called Warburg effect. Aim: To study time-dependent cytotoxicity of sodium dichloroacetate (DCA) and metformin (MTF) against metastatic tumor cells and action of these agents on tumor cell migration. Materials and Methods: In the study low metastatic LLC/R9 variant of Lewis lung carcinoma was used. The number of living cells in the cytotoxic test was evaluated using sulforhodamine B after 1, 2 and 3 days of cell incubation in vitro. The parameters of the sensitivity of tumor cells to the action of DCA and MTF in vitro were calculated using nonlinear and linear regression of experimental data. 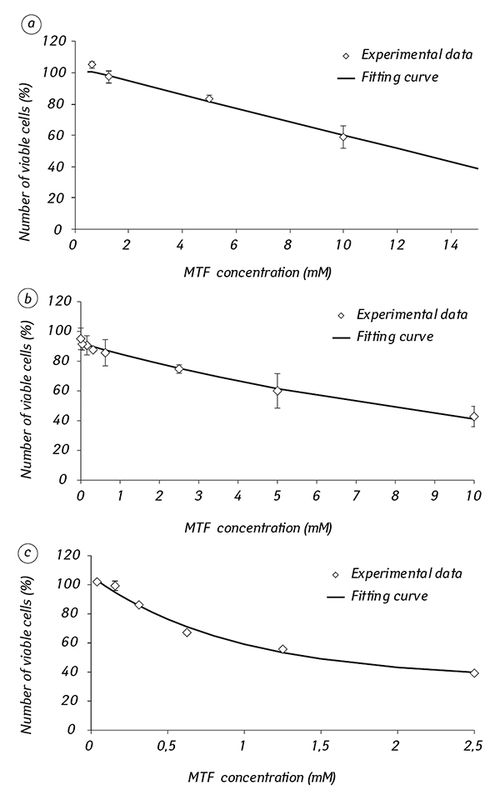 The effect of DCA and MTF on cellular motility in vitro was evaluated using a Boyden chamber by calculation of the number of cells that migrated to the bottom side of the filter within 3 days of incubation. The statistical analysis of the data was carried out with the use of descriptive methods, Student’s t-criterion, nonlinear, and linear regression analysis. Results: IC50 of DCA was found to be equal to 50.8 ± 7.6 mM at the first day of incubation with LLC/R9 cells and decreased by 1.9 (p < 0.05) and 2.1 (p < 0.05) times at the 2nd and 3rd days, respectively. Despite the almost identical ІC50 at the 2nd and 3rd days, an increase in the incubation period of cells with DCA for up to 3 days increased the C0 parameter, which reflects the maximum concentration of the agent that does not exhibit cytotoxic effects, by 93% (p < 0.05) compared to this at the 2nd day (16.2 ± 1.4 mM vs 8.4 ± 1.0 mM, correspondently). Unlike DCA, the LLC/R9 cell population was not homogeneous by the sensitivity to the action of MTF; at least at the 3rd day, an appearance of MTF-resistant subpopulation was observed, accounting for 35% of all cells. IC50 of MTF was equal to 12.1 ± 0.6 mM, and unlike DCA, this index progressively decreased at the 2nd and 3rd days by 1.4 (p < 0.05) and 9.3 times (p < 0.05) respectively. 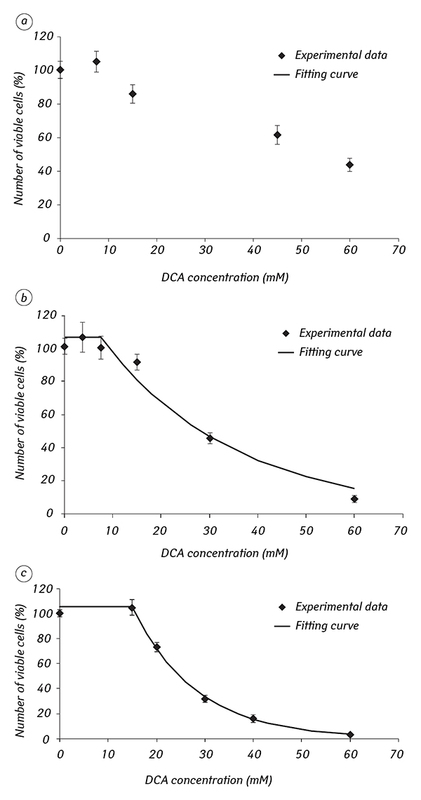 Action of DCA at a concentration of 25 mM alone and in combination with MTF at the concentrations of 0.1 mM and 0.7 mM resulted in an increase in cell migration by 65% (p < 0.05), 63% (p < 0.05) and 78.5% (p < 0.05), respectively. There was no significant effect of MTF on the tumor cell migration. Conclusions: The sensitivity of the metastatic Lewis lung carcinoma cells to the action of the modifiers of the energy metabolism increased significantly with an increase in the incubation period, apparently, primarily due to the shortage of nutrient substrates and, in particular, glucose, indicating the relevance of their combined use as well as with other agents, which promote the deficiency of glucose in the tumor microenvironment. Abbreviations used: 2DG — 2-deoxy-D-glucose; DCA — sodium dichloroacetate; LLC — Lewis lung carcinoma; MTF — metformin. Nowadays there is observed the rapid development of a new promising trend in the treatment of cancer patients, aimed on inhibiting the energy metabolism of malignant cells. This approach is based on one of the unique features of a malignant cell, namely the generation of ATP through glycolysis, even in the presence of oxygen (the so-called Warburg effect). Various ener­gy metabolizers such as 2-deoxy-D-glucose (2DG), sodium dichloroacetate (DCA), metformin (MTF), and so on are widely investigated as antitumor agents. Antitumor activity of DCA, a medicinal agent that has been used for 30 years as a means for the treatment of metabolic disorders, in particular lactic acidosis, has been confirmed in many studies in vitro and in vivo [1, 2]. Such activity is realized due to ability of DCA to inhibit the pyruvate dehydrogenase kinase and to promote redirecting of pyruvate to the Krebs cycle, and is accompanied by induction of apoptosis, increased production of active oxygen species, decreased membrane potential of tumor cell mitochondria, etc. MTF, a drug widely used to treat type II diabetes, also was found to have a high anti-tumor activity [3–5]. It is known that its antitumor activity is realized via the inhibition complex I of electron transport chain of tumor cell mitochondria, decrease of insulin/insulin-like growth factor 1, and activation of AMPK-dependent [6–9] and AMPK-independent signaling pathways . There are some studies, which de­monstrate the ability of both agents affect tumor cell migration [11, 12]. Tumor cell sensitivity to the action of DCA and MTF may depend on the type of tumor cells, their microenvironment, etc. [11, 13–15]. The aim of this work was to investigate the time-dependent cytotoxicity of DCA and MTF against metastatic tumor cells and action of these agents upon tumor cell migration. As an experimental tumor model LLC/R9 cells, low metastatic variant of Lewis lung carcinoma (LLC) was used. Cell culture. LLC/R9 cells obtained from the original LLC after 9 courses of cisplatin (cis-DDP) in vivo were used . Tumor cells were maintained in vitro in RPMI 1640 medium (Sigma-Aldrich, USA) with addition of fetal bovine serum (Sigma-Aldrich, USA), 2 mM L-glutamine and 40 mg/ml gentamicin at 37 °С in a humidified atmosphere with 5% СО2. The cytotoxic/cytostatic action of DCA (Sigma-Aldrich, USA) and MTF (Sigma-Aldrich, USA) was assessed by IC50 index — the concentration of the agent, which causes a 50% decrease in the number of viable cells in relation to control due to its cytotoxic and/or cytostatic action. The IC50 index was calculated using an appropriate mathematical model. LLC/R9 cells were inoculated into wells of a 96-well plate at a density of 1.0•104 cells/well, incubated overnight, then the medium was replaced by fresh medium with addition of DCA or MTF and incubated for 1, 2, and 3 days. Each concentration of the agent was investigated in triplets. The cells that were incubated under the same conditions without the addition of test agents, served as a control. The number of viable cells was evaluated using sulforhodamine B . The dependence of LLC/R9 survival on DCA or MTF concentrations was analyzed using exponential or linear models. where N is the number of viable LLC/R9 cells, estimated using sulforhodamine B (% from control); N0 — the proportion of viable LLC/R9 cells without the addition of agents; С0 is the maximum concentration of the agent that does not exert a cytotoxic effect; t is the parameter that reflects the sensitivity of LLC/R9 cells to the action of DCA (or MTF); NR is the proportion of LLC/R9 cells that are insensitive to the cytotoxic action of DCA or MTF. where N — number of living LLC/R9 cells (% from control); Nl — the proportion of living LLC/R9 cells without the addition of agents; С0 is the maximum concentration of the agent that does not exert a cytotoxic effect; b is a parameter that reflects the sensitivity of LLC/R9 cells to the cytotoxic action of DCA (or MTF). The model parameters were estimated by the best approximation of models to experimental data using non-linear (or linear) regression analysis and Origin v. 9.5. The migration capacity of tumor cells was evaluated using Boyden chambers. Cell suspension (1.5•105 cells in RPMI 1640 medium) containing agent (0.1 or 0.7 mM MTF, 10 or 25 mM DCA, and combinations thereof) were added into the upper cup of Boyden chambers (24-well, 8-µm pore membrane; Merck Millipore, USA). All concentrations of agents were investigated in triplets. Cell suspension without agent served as control. The lower chamber was supplied with 600 µl of RPMI 1640 medium. After 72 h, cells were fixed in formol, stained with hematoxylin, and the number of cells that migrated through the membrane to bottom surface of the cup, was subjected to microscopic analysis. Numbers of migrating cells were counted in five random selected fields. The statistical analysis of the data obtained was conducted using descriptive methods, Student’s t-criterion, nonlinear and linear regression analysis using Microsoft Excel, Microcal Origin, and STATISTICA software packages. The studies have shown that the cytostatic/cytotoxic activity of both MTF and DCA increased with the extension of the incubation period. Thus, the study of DCA has shown that with prolongation of the incubation period up to 2 days, the activity of DCA increased significantly, which was manifested by a statistically significant reduction of IC50 almost by 2 times as compared to this index for 1-day incubation (p < 0.05, Table 1). Note: *, # vs 1- and 2-days incubation correspondently, significant at p < 0.05. Attention was drawn to the fact that the dynamics of the change in the number of living cells as a function of the DCA concentration is well described by a one-exponential mathematical model, regardless of the time of incubation (Fig. 1, Table 1). This indicated the homogeneity of the tumor cell population with respect to the sensitivity to the cytotoxic action of DCA. The study of cytotoxic/cytostatic activity of MTF showed that with an increase in the incubation period to 2 and 3 days, the activity of MTF also significantly increased, which was manifested by a statistically significant reduction of IC50 by 1.4 (p < 0.05) and 9.3 times (p < 0.05), respectively, in comparison with this index at 1-day incubation (Table 2). Note: *, #vs 1- and 2-days incubation correspondently, significant at p < 0.05. The dynamics of the change in the number of viable cells as a function of the concentration of MTF is well described by the linear function for the 1st day of incubation and the exponential mathematical model in the case of 2 and 3 days of incubation (Fig. 2, Table 2). In contrast to DCA, under the influence of MTF for 3 days, the presence of a subpopulation of tumor cells resistant to MTF was detected, although after 2 days incubation, this subpopulation was not detected. The fraction of the resistant subpopulation (NR parameter) was 35% (Table 2). This evidenced that with prolongation of contact time of tumor cells with MTF simultaneously with a significant increase in sensitivity of LLC/R9 cells to the action of the agent, there was also the beginning of the selection of MTF-insensitive tumor cells. The action of both DCA and MTF on LLC/R9 cell migration was evaluated in concentrations within the non-cytotoxic values, providing 100% cell survival (10 mM for DCA and 0.1 mM for MTF), and another one close to IC50 , providing 50–60% cell survival (25 mM for DCA and 0.7 mM for MTF). According to the data obtained, action of DCA resulted in an increase in LLC/R9 cell migration only at a concentration close to IC50 (25 mM) as evidenced by an increase in the number of cells on the bottom side of the membrane by 65% (p < 0.05) compared with that in the control (Fig. 3). Сonsidering that action of DCA in a concentration of 25 mM resulted in a reduction in the number of viable LLC/R9 cells by about 50%, its ability to stimulate the migration of these cells is obviously even more pronounced. We have previously shown that LLC/R9 cells differ from the original LLC by structural defects in mitochondria , which may cause their dysfunction. The increase in the mobility of LLC/R9 cells can be explained by the restoration of the DCA functionality of their mitochondria, as shown by Sanchez-Arago et al. . Unlike DCA, MTF in studied concentrations did not significantly affect the LLC/R9 cell migration. There were no statistically significant differences in the number of cells that migrated to the bottom surface when exposed to MTF compared to control. The effect of enhancement of the migration ability of LLC/R9 cells under the combined action of DCA and MTF, apparently, was due only to the action of DCA. Thus, a statistically significant increase (p < 0.05) in migration ability was recorded only after incubation of tumor cells with DCA in a concentration of 25 mM. Moreover, the degree of effect was the same as with DCA alone. 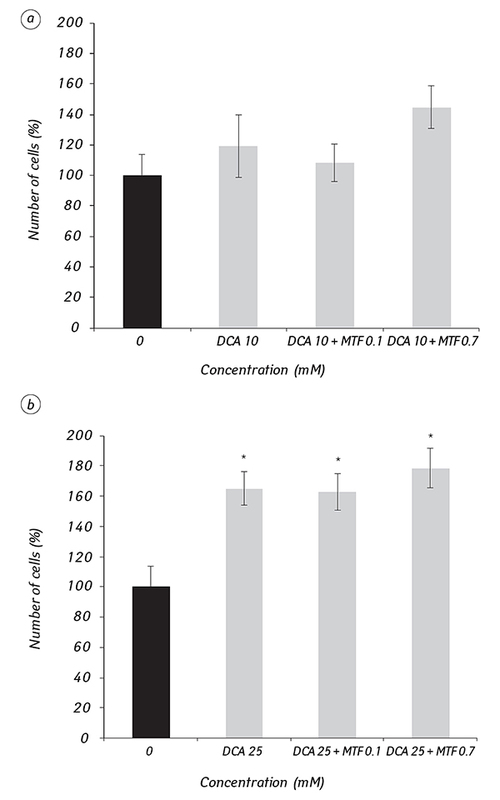 Instead, DCA at a lower concentration, 10 mM, in combination with MTF both in the concentration of 0.1 mM and 0.7 mM, did not significantly affect the migration of these cells. So, at the 3rd day of in vitro incubation, when the sensitivity of cells to its action was the highest, DCA in a concentration close to IC50 led to the stimulation of the cell migration ability. This stimulation, apparently, was associated with the activation of oxidative phosphorylation due to the action of DCA, which is known to activate pyruvate dehydrogenase, a key switch of cell energy from the glycolysis to mitochondrial respiration. This is consistent with the data , where it has been shown in a model of breast cancer cells that the activation of the mitochondrial biogenesis and mitochondrial respiration, mediated by the transcriptional co-activator PGC1α, correlated with the migration potential of tumor cells. Interestingly, despite the ability of DCA to stimulate the migration capacity of LLC/R9 cells, we previously demonstrated its high antimetastatic activity, which was manifested by a significant reduction in both the number of metastases and the volume of pulmonary metastases in mice transplanted with LLC/R9 . This can be explained by the fact that in conditions of in vivo metastatic activity of a malignant tumor is determined not only by the migration capacity of tumor cells, but also by their ability to overcome all the numerous stages of the metastatic process. One of the early stages is the loss of contact between tumor cells and the extracellular matrix and the circulation of cells in the general blood stream, which leads to the development of oxidative stress and cell death [22, 23]. The use of antioxidants helps cells to adapt and leads to an increase in the number of metastases, while inhibition of such adaptation processes, on the contrary, reduces the amount of metastases. From these positions, the ability of DCA to enhance the production of reactive oxygen species by tumor cells [24, 25] may be involved in its anti-metastatic effect in relation to LLC/R9 in vivo . Enhancement of cytotoxic/cytostatic activity of DCA and MTF with increasing incubation period is, in our opinion, due to changes in the tumor microenvironment — that is, changes in the composition of the nutrient medium during the incubation of tumor cells. Modulators of energy metabolism of tumor cells, which include DCA, and MTF, significantly affect the activity of enzymes and, accordingly, can affect the whole metabolic pathways of the cell, due to which their antitumor effect is manifested. The activity of some biochemical cycles and metabolic pathways is significantly dependent on the microenvironment of the tumor cell, including the presence of energy and plastic substrates, since the tumor cell adapts to external conditions to ensure its main goal — proliferation, as well as survival, migration and invasion. The tumor microenvironment also determines the possibility of survival of the malignant cell under adverse conditions. That is why the cytostatic/cytotoxic activity of agents whose target is the energy metabolism of tumor cells, should be significantly dependent on the conditions of the tumor microenvironment, and sometimes completely determined by it. On Fig. 4 there is shown the growth kinetics of LLC/R9 cells under the conditions of their 3 day-long incubation. The exponential phase of cell growth was observed only during the first 2 days of incubation, and then there was a slowdown in the rate of cell proliferation. This is a classic picture of the growth curve of tumor cells, and slowdown in the growth of the cell population occurs due to the exhaustion of the medium on nutrients (glucose, amino acids, etc.) and the accumulation of products of vital activity of cells (development of lactic acidosis, etc.) . For example, in the study of kinetics of cell growth of the parental LLC cells under the condition of “unfed culture” it was found that after 48 h of cell growth the 2-fold reduction of glucose concentration in the medium was observed, and complete depletion of glucose in the medium occurred in 96 h . Simultaneously, the pH dropped to a level of 6.7 ± 0.014 along with rapid increase in the concentration of lactate almost by 6 times. 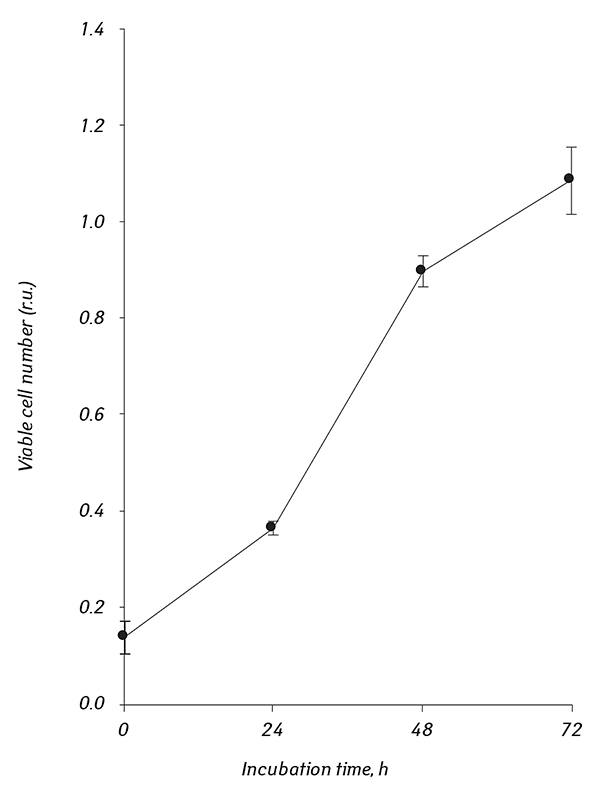 The nature of the changes in the cell culture medium in the case of LLC/R9 cell growth under conditions of “unfed culture” was similar (data not provided) — a double reduction in glucose was observed in 48 h, glucose depletion in 80 h of growth, the decrease of pH to 6.6 ± 0.02 and a drastic increase of lactate content. The most stressful factor for tumor cells is the lack of glucose in the microenvironment. That is why we believe that increase of the sensitivity of LLC/R9 cells to DCA with prolongation of the incubation period is mainly due to glucose deficiency. Our arguments are confirmed by the data on the synergistic action of DCA in combination with 2DG on MOLT4, MCF7 and HCN116 cell lines . Since 2DG is a structural analogue of glucose, which can not completely be metabolized, its effect is almost completely analogous to glucose deficiency and inhibition of glycolysis and pentose-phosphate pathway, which play a crucial role in maintaining the proliferation of tumor cells . Pro­bably, the ability of DCA to exhibit a significant inhibitory effect on the pentose-phosphate pathway is one of the mechanisms of its cytotoxic action toward LLC/R9 cells. It is interesting to analyze some of the effects revealed during mathematical modeling of LLC/R9 cell survival dependence on DCA concentration. It is evident that an extension of the incubation period up to three days resulted in a statistically significant increase in the value of the C0 parameter by 93% compared with such at 2-day incubation, indicating a decrease in the effectiveness of the cytostatic/cytotoxic action. However, IC50 value did not differ statistically from this index in a case of 2-day incubation. This effect was manifested by a more dramatic reduction in the survival of tumor cells under the influence of concentrations of DCA higher than C0, in conditions of 3-day incubation (Fig. 1), and hence, the greater sensitivity of these cells to DCA under such conditions. It is possible to estimate approximately this effect by using the “IC50–C0” index, which will reflect the actual sensitivity of LLC/R9 cells to the action of DCA. The value of the “IC50–C0” index for 2 days of incubation was 17.8 ± 3.94 mM, and for the 3 days of incubation was 7.9 ± 0.68 mM; so, the changes in the tumor microenvironment that occurred as a result of cell incubation for 3 days, potentiated the activity of DCA in relation to LLC/R9 cells more than 2 times (p < 0.05). The elevation of MTF activity in relation to LLC/R9 cells along with increasing incubation time was probably also due to a sharp decrease in glucose concentration, which prevent adaptation of tumor cells to the inhibition of the electron transport chain of mitochondria by MTF via compensatory activation of glycolysis [29–32]. For example, it is known that 2DG enhances the cytotoxic effect of MTF in relation to the LNCaP prostate cancer cell line , while glucose deficiency also leads to a significant increase in the cytotoxic activity of MTF in relation to cell lines of the thyroid cancer FTC133 and BCPAP , breast cancer MCF7, MDA-MB-231, SKBR3 and MDA-MB-468 and ovarian cancer OVCAR3 and PA-1 [31, 32]. Such enhancement of activity of both DCA and MTF at the background of glucose deficiency indicated a possibility of a significant increase in their antitumor effect under conditions of their combined use with the simultaneous creation of severe glucose deficiency in tumor microenvironment. In conclusion, the results of this study showed that the sensitivity of LLC cells to the action of the modulators of the energy metabolism DCA and MTF increased significantly with the extension of the incubation period, apparently, first of all, due to a shortage of nutrient substrates and in particular glucose, indicating relevance of their combined use or their use in combination with other agents that increase the glucose deficiency in the tumor microenvironment. Michelakis ЕD, Webster L, Mackey JR. Dichloroacetate (DCA) as a potential metabolic-targeting therapy for cancer. Br J Cancer 2008; 99: 989–94. Duan Y, Zhao X, Ren W, et al. Antitumor activity of dichloroacetate on C6 glioma cell: in vitro and in vivo evaluation. Onco Targets Ther 2013; 6: 189–98. Ben Sahra I, Le Marchand-Brustel Y, Tanti JF, Bost F. Metformin in cancer therapy: a new perspective for an old antidiabetic drug? Mol Cancer Ther 2010; 9: 1092–9. Ben Sahra I, Laurent K, Loubat A, et al. The antidiabetic drug metformin exerts an antitumoral effect in vitro and in vivo through a decrease of cyclin D1 level. Oncogene 2008; 27: 3576–86. Kisfalvi K, Moro A, Sinnett-Smith J, et al. Metformin inhibits the growth of human pancreatic cancer xenografts. Pancreas 2013; 42: 781–5. Drzewoski J, Drozdowska A, Sliwińska A. Do we have enough data to confirm the link between antidiabetic drug use and cancer development? Pol Arch Med Wewn 2011; 121: 81–7. Zhou G, Myers R, Li Y et al. Role of AMP-activated protein kinase in mechanism of metformin action. J Clin Invest 2001; 108: 1167–74. Dowling RJ, Zakikhani M, Fantus IG, et al. Metformin inhibits mammalian target of rapamycin-dependent translation initiation in breast cancer cells. Cancer Res 2007; 67: 10804–12. Zakikhani M, Dowling R, Fantus IG, et al. Metformin is an AMP kinase-dependent growth inhibitor for breast cancer cells. Cancer Res 2006; 66: 10269–73. Ben Sahra I, Regazzetti C, Robert G, et al. Metformin, independent of AMPK, induces mTOR inhibition and cell-cycle arrest through REDD1. Cancer Res 2011; 71: 4366–72. Chaudhary AK, Bhat TA, Kumar S, et al. Mitochondrial dysfunction-mediated apoptosis resistance associates with defective heat shock protein response in African-American men with prostate cancer. Br J Cancer 2016; 114: 1090–100. Trinh SX, Nguyen HT, Saimuang K, et al. Metformin inhibits migration and invasion of cholangiocarcinoma cells. Asian Pac J Cancer Prev 2017; 18: 473–7. Xintaropoulou C, Ward C, Wise A, et al. A comparative analysis of inhibitors of the glycolysis pathway in breast and ovarian cancer cell line models. Oncotarget 2015; 6: 25677–95. Anemone A, Consolino L, Conti L, et al. In vivo evaluation of tumour acidosis for assessing the early metabolic response and onset of resistance to dichloroacetate by using magnetic resonance pH imaging. Intern J Cancer 2017; 51: 498–506. Pyaskovskaya ON, Kolesnik DL, Fedorchuk AG, et al. Cytotoxic activity of metformin in vitro does not correlate with its antitumor action in vivo. Exp Oncol 2017; 39: 264–8. Pyaskovskaya ON, Dasyukevich OI, Kolesnik DL, et al. Changes in VEGF level and tumor growth characteristics during Lewis lung carcinoma progression towards cis-DDP resistance. Exp Oncol 2007; 29: 197–202. Vichai V, Kirtikara K. Sulforhodamine B colorimetric assay for cytoxicity screening. Nature Protocol 2006; 1: 1112–6. Kolesnik DL, Pyaskovskaya ON, Tregubova NV, Solyanik GI. Lewis lung carcinoma variant with a high sensitivity to antitumor antiangiogenic therapy exhibits a high capacity for autophagy. Cytol Genet 2012; 46: 155–60. Sanchez-Arago М, Chamorro M, Cuezva JM. Selection of cancer cells with repressed mitochondria triggers colon cancer progression. Carcinogenesis 2010; 31: 567–76. LeBleu VS, O’Connell JT, Gonzalez Herrera KN, et al. PGC-1a mediates mitochondrial biogenesis and oxidative phosphorylation in cancer cells to promote metastasis. Nat Cell Biol 2014; 16: 992–1003. Kolesnik DL, Pyaskovskaya ON, Boychuk IV, et al. Effect of dichloroacetate on Lewis lung carcinoma growth and metastasis. Exp Oncol 2015; 37: 126–9. Schafer ZT, Grassian AR, Song L, et al. Antioxidant and oncogene rescue of metabolic defects caused by loss of matrix attachment. Nature 2009; 461: 109–13. Piskounova E, Agathocleous M, Murphy MM, et al. Oxidative stress inhibits distant metastasis by human melanoma cells. Nature 2015; 527: 186–91. Bonnet S, Archer SL, Allalunis-Turner J et al. A mitochondria-K+ channel axis is suppressed in cancer and its normalization promotes apoptosis and inhibits cancer growth. Cancer Cell 2007; 11: 37–51. Dai Y, Xiong X, Huang G et al. Dichloroacetate enhances adriamycin-induced hepatoma cell toxicity in vitro and in vivo by increasing reactive oxygen species levels. PLoS One 2014; 9: e92962. Pyaskovskaya ON, Kolesnik DL, Kolobov AV, et al. Analysis of growth kinetics and proliferative heterogeneity of Lewis lung carcinoma cells growing as unfed culture. Exp Oncol 2008; 30: 269–75. Stockwin LH, Yu SX, Borgel S, et al. Sodium dichloroacetate selectively targets cells with defects in the mitochondrial ETC. Int J Cancer 2010; 127: 2510–9. De Preter G, Neveu MA, Danhier P, et al. Inhibition of the pentose phosphate pathway by dichloroacetate unravels a missing link between aerobic glycolysis and cancer cell proliferation. Oncotarget 2016; 7: 2910–20. Ben Sahra I, Laurent K, Giuliano S, et al. Targeting cancer cell metabolism: the combination of metformin and 2-deoxyglucose induces p53-dependent apoptosis in prostate cancer cells. Cancer Res 2010; 70: 2465–75. Bikas A, Jensen K, Patel A, et al. Glucose-deprivation increases thyroid cancer cells sensitivity to metformin. Endocr Relat Cancer 2015; 22: 919–32. Zhuang Y, Chan DK, Haugrud AB, et al. Mechanisms by which low glucose enhances the cytotoxicity of metformin to cancer cells both in vitro and in vivo. PLoS One 2014; 9: e108444. Menendez JA, Oliveras-Ferraros C, Cufí S, et al. Metformin is synthetically lethal with glucose withdrawal in cancer cells. Cell Cycle 2012; 11: 2782–92.